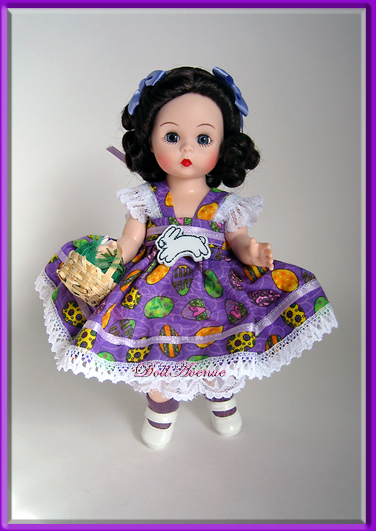 Just in time for Easter, is this 8" Custom Dressed Easter doll we call "Easter Egg Hunt." This darling Wendy has beautiful dark brunette curls with a violet ribbon bows. Wendy's Easter dress is made from a violet and colorful egg print pattern with lacy butterfly sleeves and a full skirt decorated with ribbon and lace trim around the hemline. The bodice is decorated with a bunny button and a ribbon tie loops around to tie the dress closed in the back. Under her dress, Wendy wears orange organdy bloomers, a white net slip trimmed with white satin ribbon, coordinating violet cotton socks and white Madame Alexander shoes. Wendy comes ready to hunt for Easter eggs with her own Easter basket complete with a tiny bunny and carrot.